JOHN'S main TRI-ANG PAGE with LINKS to other pages and sites. Ephemera is printed material relating to the subject in question. 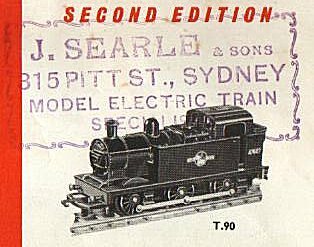 Catalogue cover images are accessible online so I've not reproduced any yet. Lynch & Gray; anyone have details on this shop? 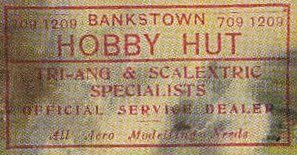 From a 1965 Australian retail price list. These were all great places to admire and buy Tri-ang, and other model railways and slot cars. If you have scans (100 dpi) of shop stamps not shown here or on the other Tri-ang pages, please forward to John. If you have any problems with the message bouncing, contact me via the Tri-ang Yahoo group. Illos of dealers' stamps and stickers taken from my catalogues; others (as .jpegs) appreciated. A page in the making.